Grandma is Back. I apologize for my long and totally unexpected hiatus. Let me give you a brief recap. Week before last, my company at the time decided they were giving us a 10% pay cut…among other things, the place was a mess. I gave my two weeks the next day, got begged to stay by the CEO, decided not to stay the next day, had the CEO accept my resignation early and ended up with a 1 week paid vacation. Then, I got a new job which I started today. So, while I was on my unexpected hiatus, I did not blog. I thought about it many times but simply never did. I was so emotionally stressed/drained after everything happened, that it took me a few days to get back to me. And of course, there was no Grandma’s Backyard involved. So, let’s get back to where I was before my hiatus. I had this blog half way done and almost ready to go up at that time. It is somewhat short but, we will now be starting back on regular postings. And I have a lot to tell you all about. I have had this Ghiradelli Intense Dark Chocolate piece at my house for way too long. I received it with a gift and have been saving it for review purposes. I waited a really long time before doing so but, I finally got a chance to eat it. Well, let’s just say it was overly bitter for me. I really did not enjoy it at all and actually debated over whether or not to even finish it. 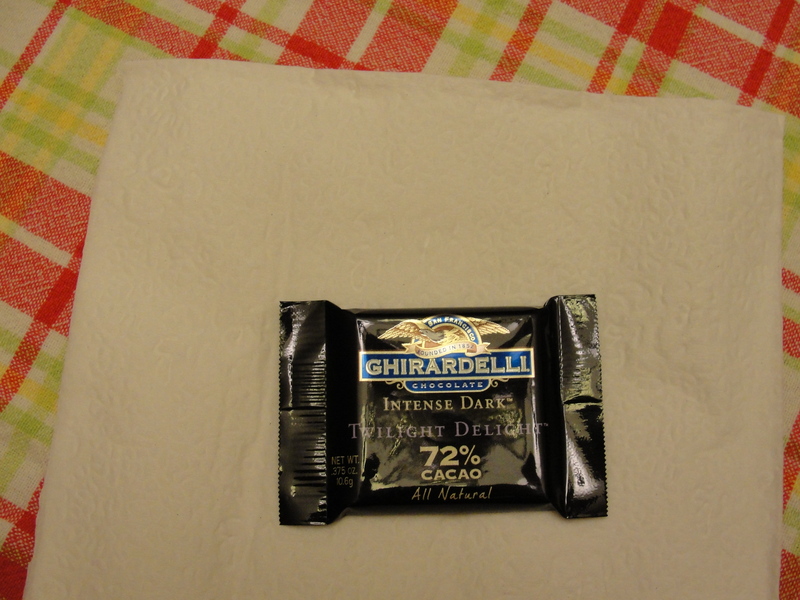 I really like that Ghiradelli has these small, indiviudally wrapped pieces of chocolate. 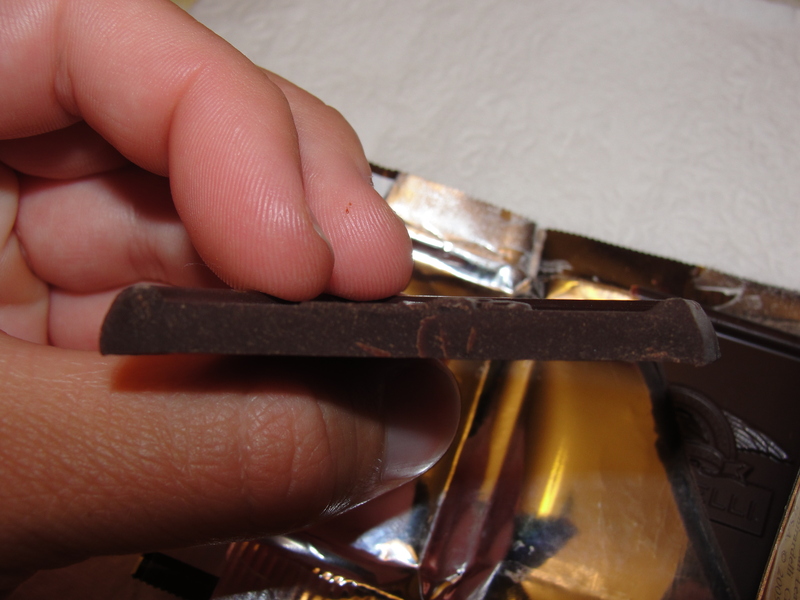 It makes the eating of chocolate much easier and doesn’t involve multiple Ziploc bags to store an oversized piece of chocolate that will take weeks to consume. 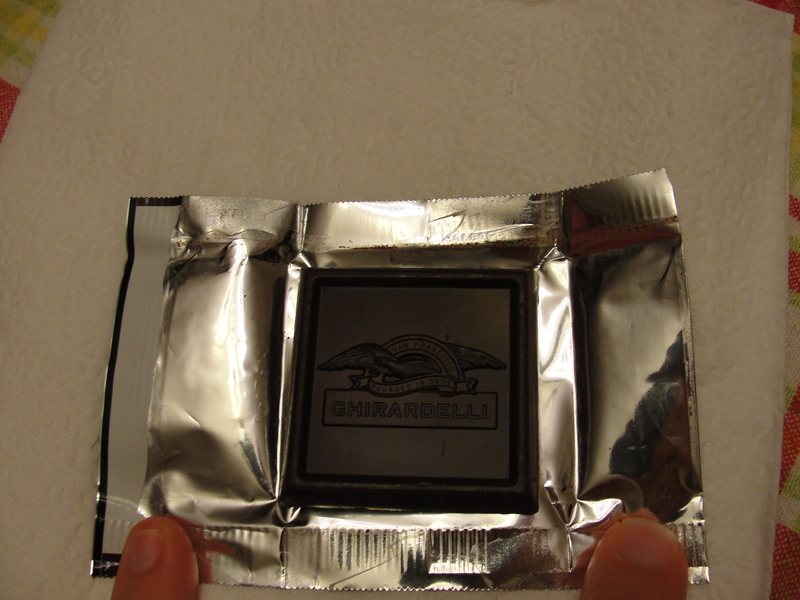 This piece of dark chocolate is part of the Intense line and states that it is 72% cocoa. This is by far the highest percentage of cocoa that I have ever had. I was never a huge fan of dark chocolate but, I have learned to give it more of a chance. I find that I enjoy it in some instances. Not all, but some. I broke this piece of chocolate into a few pieces and placed the first piece into my mouth. The chocolate did not give off any sweet flavors when I broke it and my mouth did not get any sweetness or cocoa butter right away. I let the first piece melt in my mouth and after a few moments, it almost became painful to do so. The chocolate was so bitter…the cocoa so distinct…that it was really hard for me to let this piece melt in my mouth. I fought through it but simply did not like any of the flavors I was getting at all. I had to drink quite a few sips of water after finishing this piece of chocolate. I then decided to chew my next piece. As I did so, I received more of the familar chocolate flavor and the cocoa wasn’t nearly as relevant. It was still very bitter but by eating it, rather then letting it melt in my mouth, I was able to taste more of the chocolate. Overall, I still didn’t really care for the chocolate and it was simply too intense for my woosy palate. Will I ever buy this Ghiradelli Intense Dark Chocolate – no. But, I am glad that I at least got to try this piece and, at no cost to me besides the calories. In no way am I saying that this chocolate is bad…I am simply just saying that its not for me. If you enjoy dark chocolate, then I forsee there being no reason why you would not enjoy this piece as well. For me, my palate is simply too woosy to handle something so intense. But, really, all that matters is, Grandma’s Back. Eep..I have a giant bar of this that was given to me as a gift. I’ll have to crack it open and see how it like it!